Nikki Strandskov was born in Maine and lived in several U. S. states as well as three German cities before settling in Minnesota, where she lived happily (mostly in Minneapolis) for 32 years. In 2005 she and her husband, Henrik, "retired" to Brunswick, Maine, near her brothers and sister and many other relatives. She and Henrik have one son and two daughters, plus one daughter-in-law and one daughter-outlaw, all of whom live too far away. 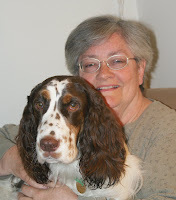 At home, they have a tricolor English springer spaniel, Rusty, and a calico cat, Heidi. 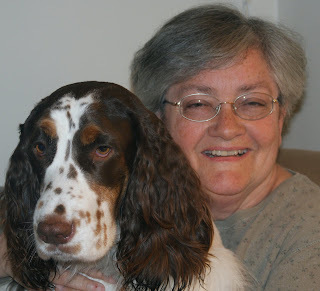 Besides reading 100 or more mysteries a year, plus other books, Nikki enjoys genealogy, collecting Christmas music and stories, collecting hymnals, watching movies and blogging. Henrik writes hymn and sometimes song lyrics (two so far with North Carolinian George Keck), takes photographs, and also enjoys reading mysteries and books on Polar exploration -- a great interest to have when one lives in the home of the Peary-MacMillan Arctic Museum. Nikki blogs at http://auntieknickers.blogspot.com/ and at http://queuingup.blogspot.com/ (the latter is all about movies), and also posts book reviews at http://www.goodreads.com/ as Auntie Knickers and on DorothyL as "Nikki in Maine." She is awed to find herself in the illustrious company of Kaye's guest bloggers on http://meanderingsandmuses.blogspot.com/. And, except for two brief drive-throughs (one on a train) when I was 2 or 3, that’s the only way I’ve ever been to North Carolina. Yet, it’s one of my favorite states, and except for the odd politician, I’m predisposed to like anything that comes from there. Why is that? doesn’t take much account of state lines, but I do know that the famous Jack Tales, collected and published by Alabamian Richard Chase, came from the Ward family in western North Carolina. As a native and resident of Far Northeast Appalachia – Maine – the Scotch-Irish basis of much North Carolina culture is part of my culture too. The land itself is beautiful, as I am reminded nearly every day in Vicki Lane’s blog – her photographs make you want to be there. I’ve been to the Rockies, which are majestic and amazing, but – I’m afraid of heights. The Appalachians are good enough for me – beauty and awe without the paralyzing terror. Kaye, my hostess for today, takes some great photos too, most recently giving us a taste of the Carolina coast on Topsail Island. Every description I’ve read of the Outer Banks has reinforced my belief that I’d like it a lot. And then, there are the books. You knew I’d get to the books, right? At 10 or 11 it was Inglis Fletcher’s The Scotswoman. I had become a staunch Jacobite from reading Sally Watson’s Highland Rebel and then found Fletcher’s book on my mother’s shelves of historical novels. A few years later, I discovered Thomas Wolfe – Look Homeward, Angel and You Can’t Go Home Again. Anne Tyler is now best known for writing about Baltimore, but she too is a North Carolinian, and I “knew her when” – having read her first two, North Carolina-set books, A Slipping-Down Life and The Tin Can Tree, shortly after their publication. Reynolds Price is a fine novelist, and his memoir of disability, A Whole New Life, gave my church Faith Exploration group much to discuss, as did Kate Vaiden. Clyde Edgerton, Lee Smith, Charles Frazier, Jan Karon, and Tony Earley are also favorites of mine and all North Carolina authors. I mustn’t forget to mention a publisher – Algonquin Books of Chapel Hill – whose imprint has proven to be a guarantee of good reading. Now, since I “met” Kaye through the DorothyL list, I need to say a bit about mysteries. What a rich crop of writers have been born in or adopted North Carolina! From Sharyn McCrumb’s Ballad Novels (and I am thrilled to hear that a new one is on the way, featuring Nora Bonesteel), to Margaret Maron’s series featuring Judge Deborah Knott and her large, loving, and sometimes eccentric family, to Kathy Reichs’s books about sometime Tarheel Tempe Brennan – I’d thought maybe that was all there was and then Vicki Lane started publishing her Elizabeth Goodweather books. She not only writes a charming blog and takes great photos, she’s a heck of a mystery writer, and I’m impatiently awaiting her next, The Day of Small Things. Looking back a bit, do search out the stories and novels of Manly Wade Wellman, which are also deeply informed by Appalachian folklore. But – what is it I really love most about North Carolina? The people. The first Tarheel I recall meeting was Sunnie Strauss, the wife of my 10th-grade social studies teacher. Jack Strauss was one of those stellar teachers who still influences me after 40+ years, and not least because he and Sunnie opened their home to me and my friends with a warmth that seemed natural then. Only as I have grown up, been a teacher’s wife, and had kids of my own in school, have I realized how unusual they were. We had great, deep discussions, a lot of laughs, and enjoyed their unique blend of Jewish and Southern hospitality. Jack is gone now, but – thanks, Sunnie. In my junior year, I was in a different school, a Defense Department-run high school in Germany. I know I met many North Carolinian students, but what I remember most is my U.S. history teacher, Jerry Pierce. For someone who was taught Union marching songs in my Maine first grade class, his Southern take on the Civil War (oops, I mean The War Between the States) was a salutary lesson in the different ways one can view history. He also was brave enough to be faculty advisor to a weekly “journal of opinion” that I and some other students started. We’re talking about an Army high school in 1964-65 – need I say more? One summer in college, one of my flatmates was Cathy Haas from North Carolina. It was a pleasure living with her and I still remember that she knew James Taylor and had a great recipe for whipped cream pound cake. A couple of my old friends from various high schools now live in North Carolina at least part time (both being somewhat peripatetic professors) and seem very happy there. And last but not least, there are the cyberfriends. Kaye Barley in particular. Yes, I know Kaye is originally and always a Marylander, but she does live in and appreciate North Carolina now. She’s the unofficial social secretary and cheerleader for DorothyL, and, I suspect, of any group she’s involved with. I’m glad to know her. I’ve also had some nice email exchanges with Vicki Lane and Margaret Maron. Reporter Allen Breed, who’s writing a book on Malaga Island, Maine, where some of my ancestors lived, has helped me with my research and I, I hope, with his. I’m pretty sure some of my RevGalBlogPals are in North Carolina too. I’m just going to have to go there some day! Well, Nikki honey, come on down! You need to spend some time here in the Southern Appalachians! Let me commend to you also Ron Rash, Lee Smith, Pam Duncan, Sheila Kay Adams . . . just for a start -- NC is full of talented writers. Just remember, "Nothing could be finer than to be in Carolina . . ."
Thanks, Vicki! And thanks again to Kaye, especially for doing all the linking, which I couldn't figure out how to do long-distance, as it were. I hope the links will encourage people to try some of the music or writing they don't know already. I agree with you about North Carolina, but I think I'd include South Carolina too. As a child our family vacationed in North Carolina at both the beach and in the mountains (Asheville). This is a tradition that i have continued as an adult as often as possible-though we tend to migrate to the South Carolina beaches. I think that the people of the Carolinas are some of the friendliest and most polite people in the world. When we get to where we are going, the stress and hassle of life just seems to float away. We'd love to retire in one of the Carolinas but with the economy, I'm not sure "retire" is ever going to happen! Caryn, I have been spending a week or so a year on an island off South Carolina for the last 5 years and you are right. Love the music links! Thank you! Nikki - I'm with Vicki; come on down!!! You have covered a lot of very special things with this wonderful piece, and I love it! ! ! You've also introduced me to a couple of NC writers I was unaware of - thank you! !